Story about this pearl: Here is a beautiful part of American history -- a large, natural freshwater pearl from the Mississippi River system. These pearls were widely used in jewelry of the 19th and early 20th centuries, but are now rare, since dredging of the river over the decades has eliminated the pearl beds. 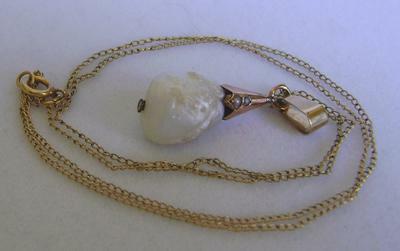 This pendant dates from circa 1910. The off-white, lustrous pear-shaped pearl is capped with 14K rose gold, set with two tiny seed pearls. The pearl alone is slightly over 1/2 inch long -- a substantial size for a natural freshwater pearl. 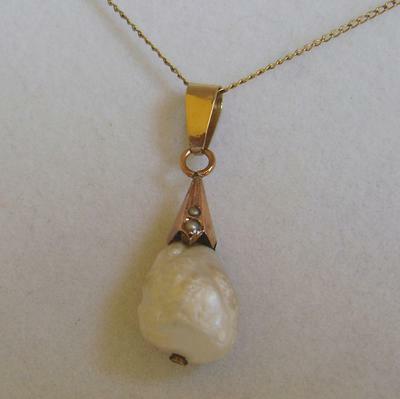 The pendant measures 1-1/4 inches from the top of the (added) 14K gold bail, to the base of the pearl. An antique gold-filled chain (20 inches long) from the same era has been provided so that the pendant is immediately wearable; or substitute your own chain. Don't miss this highly collectible piece! 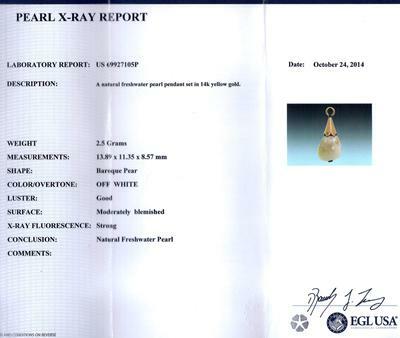 The certificate shown is included with the pendant. 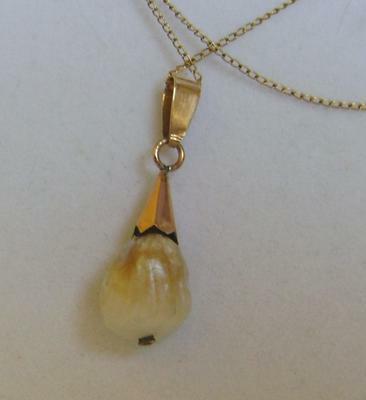 Return to Listed - Antique Natural Pearls & Jewelry.